Hello and welcome to the urchin home. So glad you guys stopped by to see us. 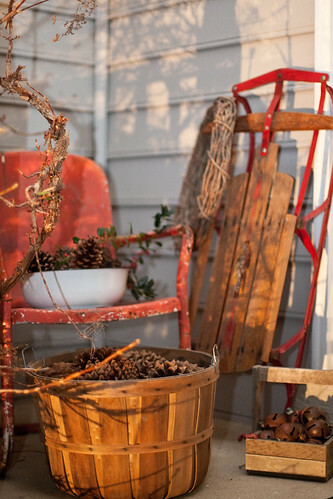 I decorate the porch with my childhood sled, a grapevine wreath, a vintage red lawn chair, a lot of pinecones, and some rusty jingle bells. The large pinecones are from sugar pines and the smaller pinecones are the cinnamon scented ones. Their scent would be way too much in the house but on the porch it’s rather nice. The bells are oversized and rusty. 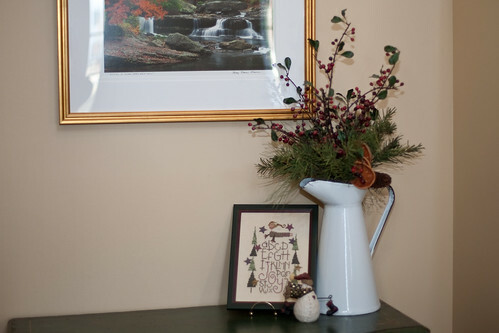 I try to keep the entryway fairly simple when I decorate for the holidays. We have one cabinet in there and I don’t like the top of it to be cluttered with decorations, I do enough cluttering of it daily with my keys and mail. 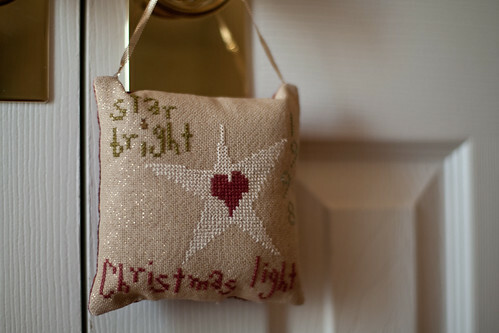 The little pillow hangs from a front closet doorknob and says “star bright… Christmas light” and has the year Papa and I were married on it. 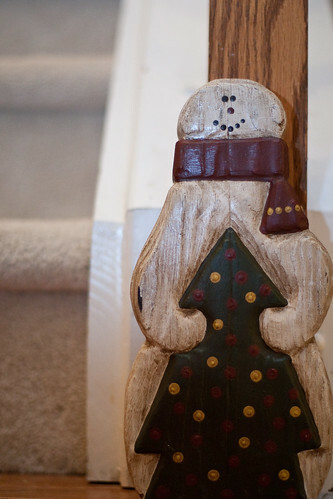 The snowman sits at the bottom of the stairs right next to the living room which is where we’re headed tomorrow. If you’d like to join the tour just post some photos to your blog or flickr and let me know so I can add you to the list. Love the snowman! And your front porch. Lovely arrangement in the white pitcher, too. Here there is a green wreath on my front door (sorry, no photo) and that is the extent of my decor. I gave all of my decorations to my daughter many years ago, as we always spent Christmas at her house. Now I’m usually away at one or the other for the holidays and I see not reason to decorate to the nines if there is no one here to enjoy it. I have to do it next week … this week got away from me! I love all your decorations! They look great! I’m realizing as I look at this that we really have very few decorations. Maybe that is one of the problems. Of course, my house is also pretty small, but still, we could use a few more things.